David Hogg was thrown into the national spotlight after the tragic shooting at Marjory Stoneman Douglas High School on Valentine's Day. 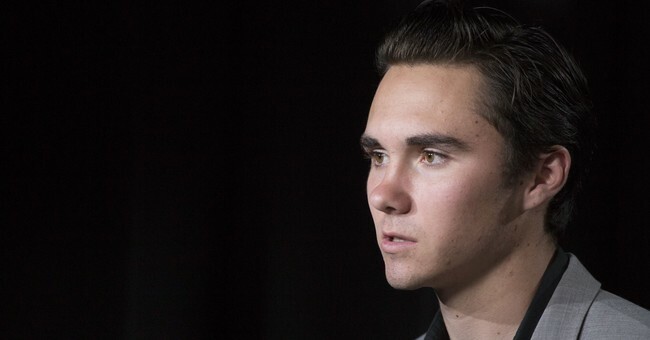 Ever since then, Hogg has become one of the faces of the "March for Our Lives" movement, the gun control group that is predominantly made up of Stoneman Douglas survivors. Since Hogg has become a household name, he assumes that he knows anything and everything about guns. Hint: He doesn't. Earlier this week he tweeted out one of the dumbest things he's ever said (and there have been a lot!). According to Hogg, an AR-15 is an "assault weapon" (WRONG!) and is designed to hunt. Let me guess, does AR also stand for "assault rifle" in your book of gun knowledge? At least gun rights activists were quick to educate Hogg and his followers. The Washington Free Beacon's Stephen Gutowski brought up a handful of very important factors to take into account, like how an AR-15 is set up and how they compare to hunting rifles. You mean...people defend themselves...with something other than a...MUSKET?! Also, the effective range of an AR-15 varies a tremendous amount based on how its set up. That doesn't really mean much when it comes to whether it's suited for defensive use. Pretty much every firearm is effective beyond the distance most self-defense encounters happen at. Remember: ARs are definitely one of the most customizable guns on the market, if not the most. There are probably more "Frankenstein" guns out there than one that is 100 percent factor new. That's why gunnies like ARs and that's why they're gaining more popularity. Additionally, most AR-15s are not set up for long-range shooting. Your average bolt-action hunting rifle tends to be chambered in a higher-caliber round with a far greater effective range than an AR-15. Translation: just because an AR-15 is big and scary looking and doesn't look like a "traditional" hunting rifle doesn't mean that it's any more lethal or deadly. In fact, the AR-15 tends to be set up for close-quarters encounters. To my knowledge, it is the most popular home-defense rifle in the United States. Most AR-15s are built with the purpose of home defense in mind. People also use shotguns for home defense, something Hogg would say is for the "hunting" of people. Does that make those firearms more deadly? Nope. It's hard to take someone seriously when they've never seen a gun like the AR-15 in person, let alone shot it. Mr. Hogg, before you continue to spread misinformation it would do you some good to study up on basic firearms knowledge. A great start would be a hunters education course. They talk about the difference between handguns, rifles, shotguns and everything in between. I'd be more than willing to pay the $10 for you to take the course. And yes, this is a serious offer! Or, if you'd like some personal one-on-one experience, there are plenty of hunters and firearms experts who would gladly educate you on what you don't know. All you have to do is ask.